The last general elections in December resulted in a hung parliament and parties failed to agree on a coalition. A woman casts her vote for the national elections in Barcelona, Spain. 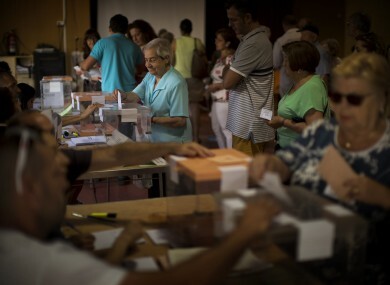 JUST DAYS AFTER a shock Brexit, Spaniards started voting in repeat elections today to decide if they too want a radical change as promised by a far-left coalition led by Podemos. The polls, which opened at 7am under a generally blue sky nationwide, are pitting voters hungry for change in a country with sky-high unemployment against those who fear this change would worsen the situation for Spain, which was on the brink of collapse just a few years ago. Britain’s surprise vote to leave the European Union has further exacerbated this cleavage, with the outgoing conservative Popular Party (PP) insisting on the need for “stability” in the face of “radicalism” and “populism”, in a thinly-veiled dig at the Unidos Podemos coalition. “If you want a united country and not a radical Spain, think about it, go for what is safe… vote for the Popular Party,” acting prime minister Mariano Rajoy said in one of his last tweets before the obligatory day of campaign silence. Voters have the choice between four major political groupings after the emergence of Podemos and centre-right upstart Ciudadanos last year uprooted the country’s two-party dominance. This upheaval meant that the last general elections in December resulted in a hung parliament, after which parties failed to agree on a coalition, prompting today’s repeat vote. Opinion polls suggest the results today will also be fractured, with the PP coming first without a majority, tailed by Unidos Podemos, which could replace the 137-year-old Socialist party as Spain’s main left-wing force. Political leaders will have to go back to the negotiating table, under more pressure this time to form a coalition. Throughout the latest campaign — and again on Friday after Brexit — the PP has hammered away at the need for stability in reference to the rise of Unidos Podemos, which like Greece’s ruling Syriza party rejects EU-backed austerity and pledges to fight for the least well-off. Unidos Podemos — the “o” of Unidos shaped as a heart — has made “smile of a country” its slogan for an emotional campaign. Rajoy argues that since the PP came to power in 2011, it has brought Spain back to growth and overseen a drop in unemployment — though at 21 percent it is still the second highest rate in the European Union after Greece. Ileana Vellon Garcia, a 51-year-old cleaner in Madrid, will vote for Unidos Podemos. “They represent change. I was for the Socialists for a long time, but they have really disappointed me,” she says. Whether Brexit will have any influence on Spain’s election is as yet uncertain. But for Vicente Serrano, a 74-year-old retiree in the southeastern port city of Alicante, uncertainty is not a good thing. “At a time of such sudden changes in the world — look at the United Kingdom — I’m opting for the right because it tends to be less fickle,” he says. Email “Spanish voters go back to the polls for second election in six months”. Feedback on “Spanish voters go back to the polls for second election in six months”.